A new booklet on Thames history - part of the A to Z series. 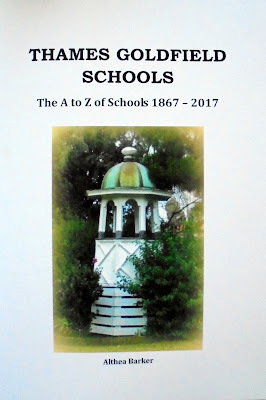 Thames Goldfield Schools: The A to Z of Schools 1867 - 2017. Research snippets that cover the opening and closing of schools both private and public. Lots of names both pupil and teachers. Addey’s (Mr & Mrs) School, Bargrove’s Ladies School, Central School, Catholic Schools (St Joseph, St Thomas of Aquin’s, St Francis), Cornes’ Private School, Davies (Mrs) Preparatory School, Donovan’s (Miss) Establishment, Early Childhood Schools & Centres, Establishment for Young Ladies, Eureka School, Fleetwood’s (Mrs) School, Harvey’s (James) Girls School, Hauraki School, High School (The), Karaka School, Kauaeranga Boys’ School, Kauaeranga Girls’ School, Kauaeranga Valley School, Kirikiri School, Kopu School, Ladies Seminary see Cary’s School, Maberly’s (Mrs) School, Moanataiari School, Murphy’s Hill School, North School, O’Reilly’s (Miss) Young Ladies School, Parawai School (old), Parawai School (current), Phelp’s (Mrs) School, Punga Flat School, Sandes Street School, Shellback School, Shortland School, Smith’s (Mrs) Seminary, South School, St George’s School, Tararu School, Thames Grammar School, Thames High School, Thames Manual & Technical School, Thames Orphanage & Training School, Thames School, Thames School of Mines, Waiokaraka School, and Waiotahi School. Where can you read it? Copies will be given to The Treasury and Thames Library, Thames.